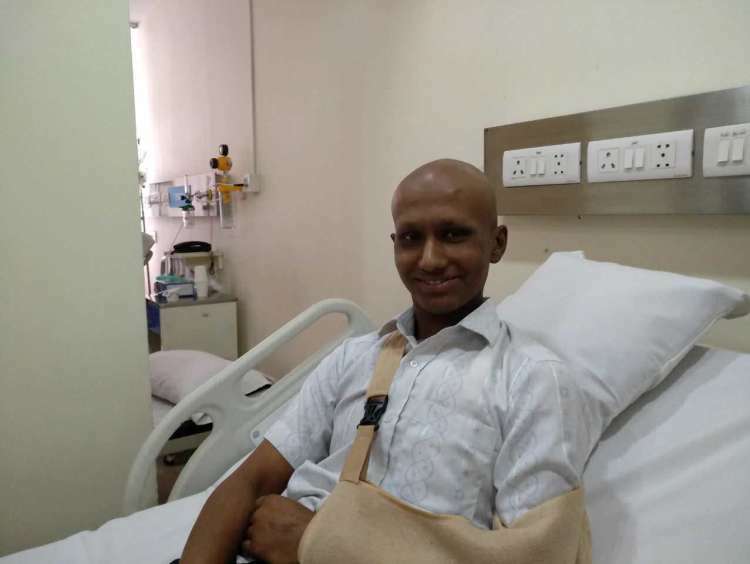 It began with Paramesh noticing a swelling in his upper chest two years ago. He was pursuing a diploma from a college in Bangalore. We went to the hospital hoping that the doctor would tell us that our son’s condition was commonplace. But the look on the doctor’s face had us worried. We could sense our lives taking a turn for the worse. We hoped that the medical tests would put our fears to rest. The next few hours, though, brought the roof crashing down on the dreams we had nurtured for our son. 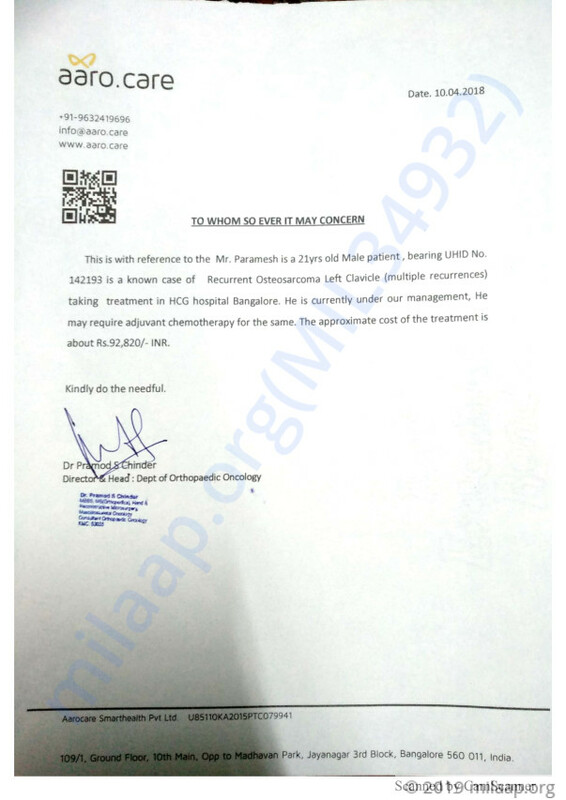 The results confirmed the doctor’s initial guess that Paramesh had cancer. He was diagnosed with Osteosarcoma - bone cancer. In a matter of few days, he had to give up doing all that he liked. From his favourite food to playing cricket, which is his favourite sport. All the little joys of his life were washed away. Computer Science fascinated him. He aspired to become an engineer. Now, all he can think of is the next day. Sometimes, tears roll down his cheeks, even as he tries to smile. He has no strength left in him to speak. My wife, Mallamma, while inconsolable, puts up a strong face in front of us but breaks down in solitude. 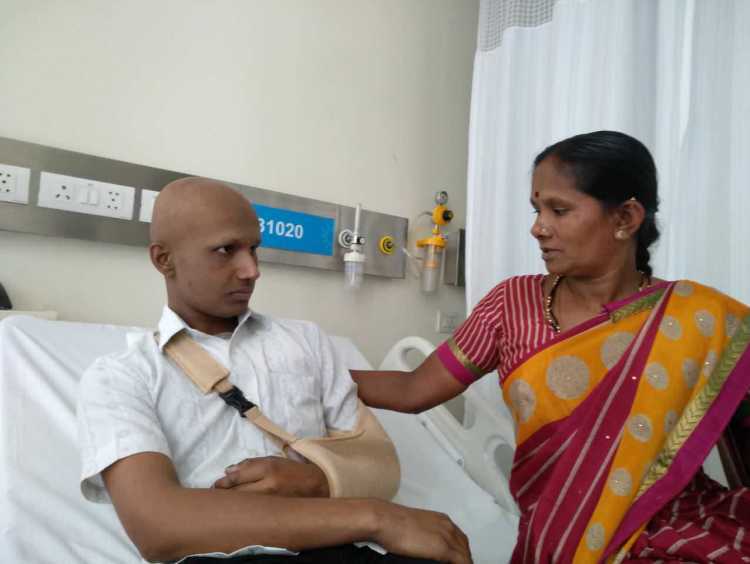 Paramesh has undergone 4 surgeries in less than 2 years. The side effects of chemotherapy have turned him into a shadow of the teenager he was just a few months ago. We hail from a small village in Yadgir district, Karnataka. Twenty years ago, Mallamma and I - came to Bangalore to find livelihood. We have been working in construction sites, earning just enough to meet ends. In spite of such poverty, we were happy we gave our son all that he wanted. Ever since he told us he wanted to do engineering, our sole focus was to leave no stone unturned in helping him do so. All our dreams and hopes were nurtured with him at the heart and soul of it. What else can poor, illiterate parents desire? What matters more than seeing their children grow into a successful people? 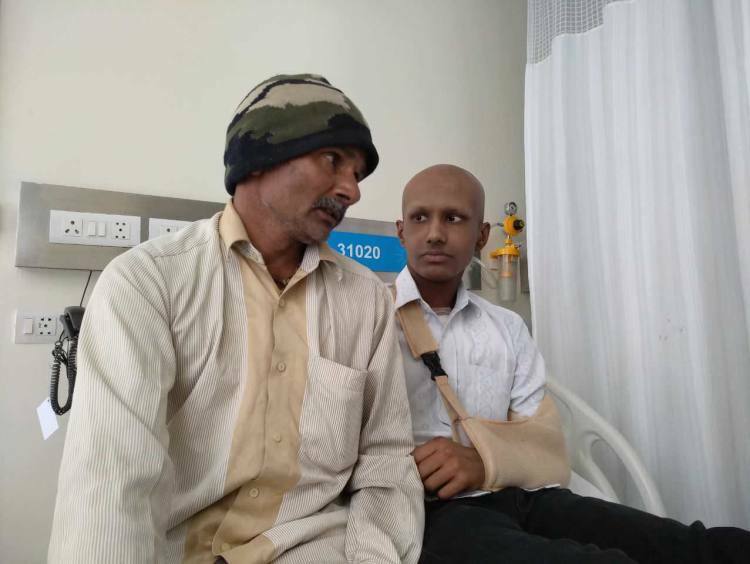 My second son (17) stares at a bleak future with a cancer-stricken brother, and me - his ailing father. Only his mother is fighting to keep the family going. Having spent more than Rs 10 lakh so far, we are seeped in debt. There is even a fear of relapse if we fail to pay for the next 6 chemotherapy sessions now. While there is hope to keep a relapse at bay, we are penniless. My wife is the sole breadwinner for this family of 3. I suffered a stroke a little more than a year ago and can’t work anywhere. No matter what, we want our son back home - hale and hearty. Paramesh has bone cancer and has undergone four surgeries so far. 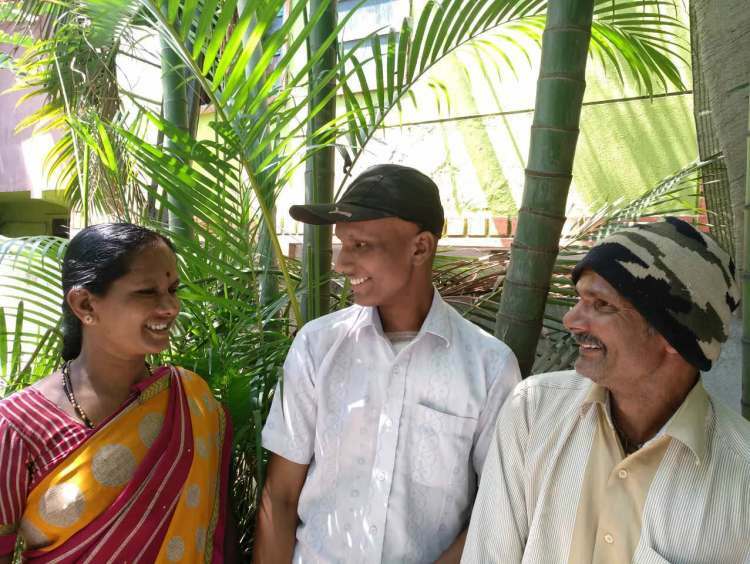 His parents earn daily wages and have exhausted all financial means to fund the remaining chemotherapy procedures that can help him recover. 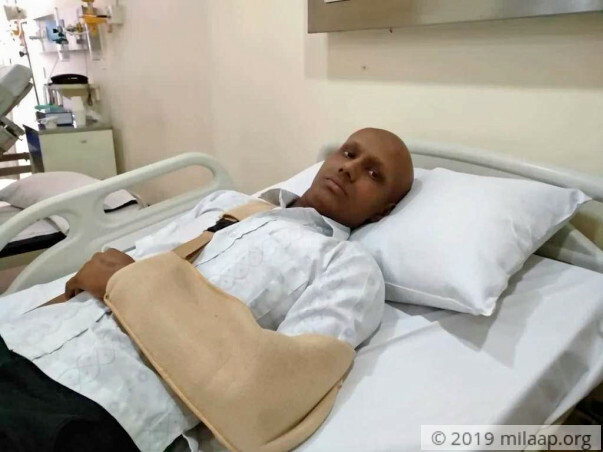 Paramesh underwent a surgery and is doing fine. Currently he responding to the treatment and is responding slowly to the treatment.